What are your customers doing when they’re online? With all the online social networking hype around, is there a way to figure out how to make the most of it and help boost your online sales? What should you know before you invest in reaching out to them? In any case, you need to learn more about your customers and their online social behavior, and Social Technographics can help start you up. 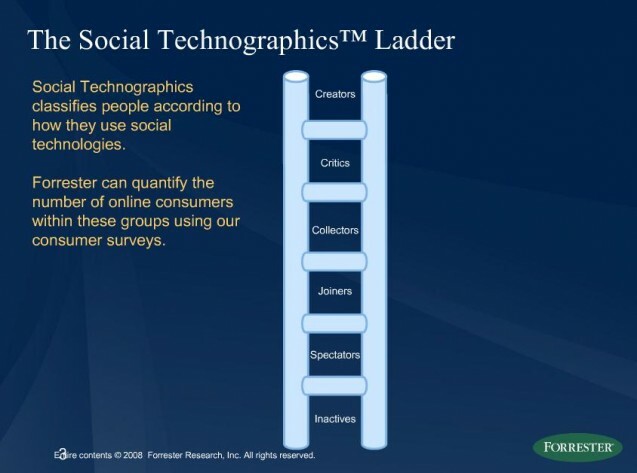 Social Technographics is a new term introduced by Forrester Research which defines their model of classifying online consumers in six levels of participation in adopting social technologies. And while at first I found some amusement in the fact that there’s six of them, much like the widely adopted idea of six degrees of separation, it’s easy to see the value it brings to the table. This model can be very helpful to anyone trying to embark on the journey of marketing their business to the growing community of social networking participants. Everyone wants to leverage these emerging social networks to grow their business, but often lack some of the basic ingredients for making any successful marketing effort – you’ve got to know your customers. And since small businesses around the world can’t boast their huge market research budgets, there’s no harm in using something that’s already out there. This model can help many businesses get back to basics – it is a great framework for online merchants to start getting a better understanding of the whole “social networking” buzz and to see where their customers fit in. Since many of us would find ourselves in more that just one group, the model works (and is typically presented this way) as a ladder with Inactives on the bottom and Creators on top. Forrester’s recent survey (Q2 2009) on social technology usage by consumers around the world is accompanied by the Social Technographics Profile Builder – an interesting tool which brings the percentages of selected demographics that are in each of the previously defined groups. The data comes from the global survey with over 37,000 total respondents with many huge markets covered so you’ll probably find some of these results very interesting (they go in greater depth with some countries while for some the samples were not large enough to provide reliable answers). Click around this tool, play around with the data, try to see what’s the typical online social behavior of your target demographic groups. Is there anything that surprises you? This model can help you understand how your customers behave while they’re online and you can take that knowledge to try to determine what would be the best communication channels to use when reaching out to them. While it won’t tell you where exactly to invest to get the best ROI for your specific target group (is there actually a tool that can do that? ), it’s a great starting point for discussing any social media strategy for growing your business, especially if you’re new to the concept.